Zack learns that appearances aren’t everything when he has an up-close-and-personal monster encounter in this chapter book adventure. Zack Nelson raced through the front door of Sprockets Academy. He was late for school. Zack had dozed off that morning after his alarm went off. Breakfast took longer than usual, and his dog, Luna, had insisted on a last-minute walk. Zack dashed across the wide lobby and ran into a round opening in the wall. A door hissed shut and he took off. The clear round elevator looked more like a giant plastic ball. It sped through a tube going sideways. Then a few seconds later it stopped. A door whooshed open, and Zack burst into his classroom. Everyone in the class was already in his or her usual seat. Zack ran toward his seat and suddenly stopped in his tracks. There’s someone in my seat! Zack thought. He looked closely. No! Not someone, some-THING! A monster! A huge purple monster sat in his seat. The monster was at least four times as big as Zack. It was furry with green patches, and it had five eyes. Its floppy ears stuck out from its face. I’ve got to save my class before the monster does something terrible, Zack thought. But how? Zack spotted Drake Taylor. Ever since Zack and his family moved from Earth to Nebulon, Drake had been his best new friend. Zack hurried to Drake’s side. “Drake! What is that thing doing here?” Zack whispered, pointing at the monster. The monster yawned. Its mouth was filled with big, sharp teeth. “What’s it going to do to us?” Zack asked. Drake gave Zack a puzzled look. Before Drake could reply, their teacher, Ms. Rudolph, came into the room. Zack stared at Ms. Rudolph in disbelief. Doesn’t she see it? he wondered. Isn’t she afraid of the monster? Ms. Rudolph soon began her lesson. Zack looked around at his classmates. They were all paying attention. No one seemed bothered by the fact that a big purple monster was right there in the room. Zack slipped into an empty seat. Ms. Rudolph continued the lesson. What’s wrong with everyone? Zack wondered. Why aren’t they scared? 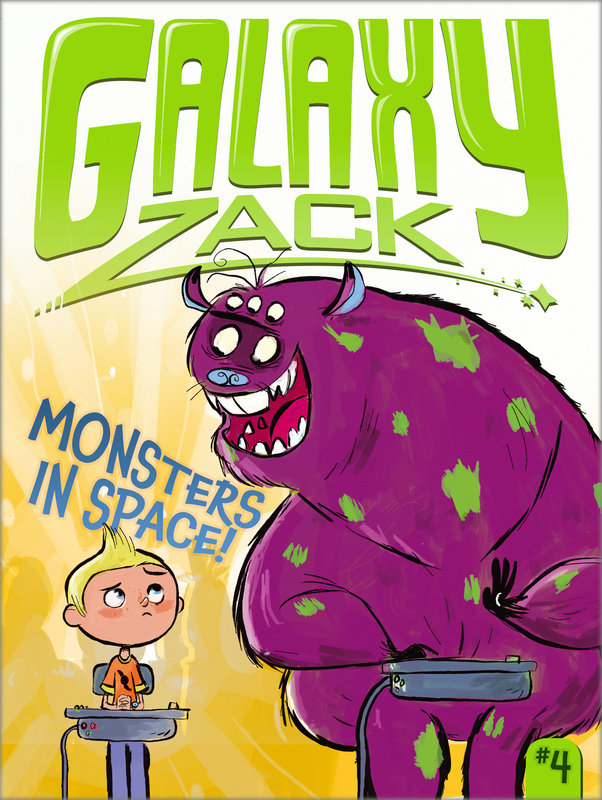 Book Cover Image (jpg): Monsters in Space!